Since 2006 the park has been preparing a plan to envision and define the future of the National Mall. We are nearing the end of the process. 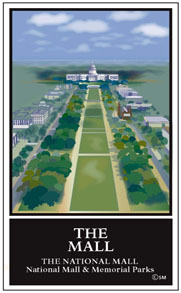 During spring 2010 the NPS has been responding to public comments received on the Draft National Mall Plan. A final 2-volume plan incorporating changes and responding to comments has been issued. A summary plan will then be prepared describing and illustrating the preferred alternative or proposed agency action. The Record of Decision related to the National Mall Plan was signed on November 9, 2010 by Secretary of the Interior Ken Salazar and NPS Director Jon Jarvis, at the recommendation of the Regional Director and Superintendent. The Record of Decision, which summarizes the plan and its requirements, is posted and will be published in the Federal Register. The National Capital Planning Commission approved the plan at the December 2, 2010 meeting. NPS can now move forward. The plan sets a practical, ambitious but achievable vision for a sustainable National Mall where visitors feel welcomed and proud of this space that symbolizes our nation. The plan is important because the level and kinds of use the National Mall receives today could not have even been imagined in past plans (1791, 1901, 1930s and even 1970s). As planning began there was more than $450 million in repairs needed, and those repairs did not address needed improvements to meet the high level of use. The wear and tear from more than 25 million visits annually contributes to the deterioration of the historic landscape and its vistas; results in lack of basic and convenient services such as restrooms, water and food; and the need for improved information, access and circulation. The National Mall is the heart of the area where citizens and others learn about American values, democracy and culture. The National Mall is the primary civic space for our nation where we gather for recurring annual national celebrations and express our First Amendment rights. Its memorials are symbols of our nation. The National Mall, the adjacent U.S. Capitol, White House & President’s Park, museums and federal buildings belong to us all.